The solicitation for the Launch Service Procurement competition is now on track to be released this month, said Col. Robert Bongiovi, director of the Launch Systems Enterprise Directorate. COLORADO SPRINGS — The Air Force is poised to solicit proposals this month for national security launch services and select two providers in 2020. A call for proposals was expected to be released March 29 but was put on hold amid criticism that the Air Force was narrowing the playing field too soon. The solicitation known as the Phase 2 Launch Service Procurement (LSP) is now on track to be released this month, Col. Robert Bongiovi, director of the Launch Systems Enterprise Directorate at the Air Force Space and Missile Systems Center, told SpaceNews. The request for proposals (RFP) will move forward despite objections raised by Blue Origin, a new player in the national security launch market. 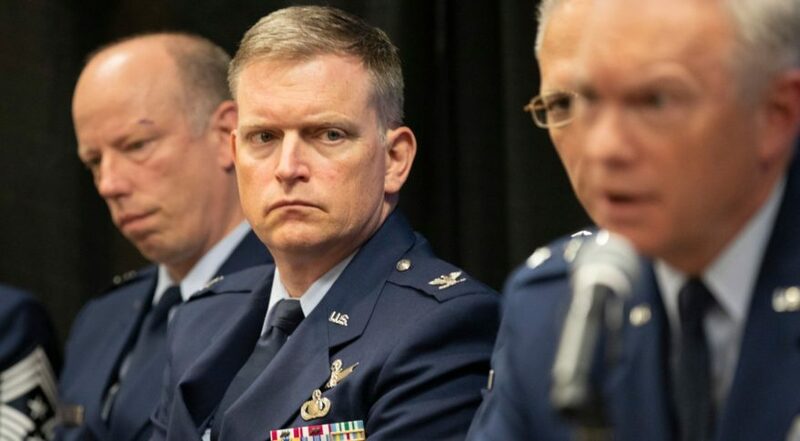 The company has argued that the Air Force is rushing to select two providers to split national security launches 60/40 between 2022 and 2026 and that the schedule gives an unfair advantage to more established players. During an interview April 11 at the Space Symposium in Colorado Springs, Bongiovi said the Air Force has listened to companies’ concerns and is ready to move on with the final RFP. “We just did two rounds of draft RFPs. We got 1,500 comments. We met with providers one-on-one to really understand their concerns,” he said. The field of competitors includes Blue Origin, United Launch Alliance, Northrop Grumman and SpaceX. The first three companies in October were awarded $2.3 billion in so-called Launch Service Agreement (LSA) funding to develop next-generation rockets and the infrastructure to support national security missions. SpaceX did not receive an LSA contract but is still expected to compete for the LSP award — although the company’s congressional supporters have warned that SpaceX might sit out the competition unless it too receives LSA funding. Every competitor has shown progress in developing their systems, Bongiovi said. “We have a solid base of launch systems out there,” he said. The schedule is not being rushed, he said, and was designed so the Air Force can have new vehicles ready for 2022. “Our original plan had us at one point awarding the procurement of launch services at the same time that we were going to award the LSA,” said Bongiovi. The Air Force later decided to separate the two to “buy us some more time,” he said. The RPF has to go out so vendors can be selected next spring. The company has not publicly said whether it will enter the LSP competition and declined to comment for this article. An industry source said SpaceX behind the scenes has pressed the case that it has been put in a competitive disadvantage not only because it didn’t get LSA money but also because the Air Force will not select the two LSP providers based on price alone, something that would give SpaceX an edge. The industry source said the way the Air Force laid out the selection criteria — a combination of technical performance, operational readiness, business case and price — gives the government a lot of discretion to determine who provides the “best value,” a process that commercial players like SpaceX and Blue Origin view as favoring the most established provider, ULA. The industry source said SpaceX is weighing its options but is not expected to pursue legal action the way it did in 2014 to compete in the EELV program. It would be shocking if SpaceX chose not to bid for Phase 2 because they have the most mature rockets in the field. Although the company would not have to pay for vehicle development to compete for Phase 2, it would still have to self-fund the infrastructure needed to meet national security launch requirements, such as a vertical payload integration facility on the East Coast. This has been a sore issue for SpaceX as its three competitors are all being subsidized by the Air Force to build that infrastructure. SpaceX also is challenging the narrative pushed by Blue Origin that the LSP schedule favors both national security launch incumbents, ULA and SpaceX, the source said. “Blue Origin is pushing this narrative forward because they’re trying to make this seem like it’s a competition that’s unfair to them,” the source said, while SpaceX sees itself in an unfair position after the Air Force awarded billions of LSA dollars to its competitors. One of the more puzzling aspects of the LSP is how the Air Force plans to award launches once the two providers are selected in 2020. Competitors are not bidding for specific missions but instead have to propose vehicles that can meet requirements to fly to nine reference orbits and carry different payload classes. “It’s called a requirements contract,” said Bongiovi. This is different than the previous EELV contracts that were awarded for specific missions. In the National Security Space Launch program, the two providers selected for Phase 2 will be assigned the specific missions on a yearly basis over the five year period. “I call it a batting order,” Bongiovi said. After the Air Force picks the two winners, it will decide who gets 60 percent and who gets 40 percent of the missions over the five-year period but will assign specific rockets on a yearly basis depending on the required missions. That gives the government more flexibility to manage the manifest, said Bongiovi. This approach would save the government the cost of making contractual changes if it needs to change the timing of the launches as it often happens when satellites are not ready. In 2020, for instance, the Air Force will look at how many missions will be needed for 2022 and decide which of the providers gets what missions that particular year. And that process will be repeated annually to even out the 60/40 split over the five year period. The launch business “is going to be a little bit more dynamic than it was in the past,” said Bongiovi. “We can’t predict exactly what’s going to be ready or how is the department going to prioritize these launches,” he said. The Air Force wants to be able to adjust the manifest accordingly while minimizing contractual headaches. As far as vendors having enough business predictability and time to prepare, that was taken into account too, said Bongiovi. One of them will know upfront it will get 60 percent of the missions. The other will know it will get 40 percent. And once a plan is decided for each year, the vendors will know the order of the missions. The forthcoming release of the Air Force RPF for launch services was a hot topic last week at the Space Symposium, where senior executives weighed in on the competition. 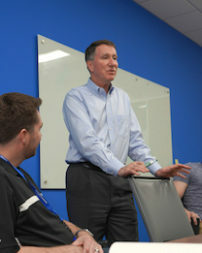 Much of the attention was on Blue Origin’s CEO Bob Smith. 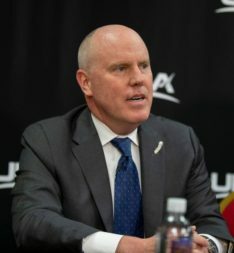 During a news conference April 8, Smith said the company looks forward to the competition but expressed concern that the schedule might not allow enough time to mature its New Glenn rocket. Downselecting vendors in 2020 “just seems premature,” he said. “We can probably delay and still have the same level of competition, perhaps even better insight,” Smith said. “These are big one-way door decisions that we have for the nation and what infrastructure will be put down and how we put that down is important,” he said. “And so you’d think more time would actually be beneficial … and would be better for the country.” If the Air Force sticks with the schedule, however, “We’ll be glad to compete in LSP,” he said. The Air Force requires all three companies that received LSA funds to bid for the Phase 2 award. The losers of Phase 2 will have their LSA agreements terminated. United Launch Alliance CEO Tory Bruno said he agrees with the Air Force that postponing the release of the RFP or the downselect would risk not being able to meet the 2022 congressional deadline to stop buying Atlas 5 launches. ULA is developing the Vulcan Centaur, powered by Blue Origin’s BE-4 engine. 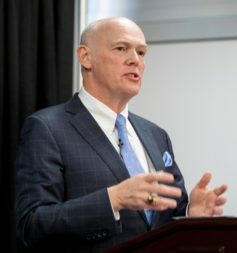 Kent Rominger, Northrop Grumman’s vice president of OmegA capture, said April 8 at the Space Symposium that company completely agrees with the schedule put forth by the Air Force and in fact would not mind if it were accelerated. He said Northrop can “compete with these new space companies that are really leaning forward and have changed the world when it comes to affordability.” Although the solid-fuel OmegA is a brand new design, it uses existing hardware and avionics that Northrop Grumman grabbed from its other vehicles.